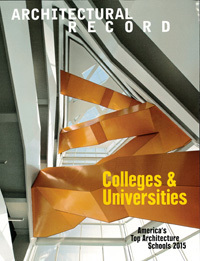 Each issue of Architectural Record brings you comprehensive coverage of a variety of projects from around the world. Record’s project profiles inform and inspire with powerful photography, architectural drawings, revealing insights from architects and clients, related building science and digital technology coverage, and key people and products. In addition, Record’s monthly Building Types Studies allow you to compare and contrast some of the best examples of a single project type. And the quarterly Record Lighting editorial sections provide dazzling portfolios of innovative lighting projects and resources. Also, each issue of Architectural Record provides an in-depth view of practice techniques where you can learn from the ideas, organization and experiences of successful firms large and small. Subscribe today and see for yourself why Architectural Record has been the leading architectural publication for 110 years. Published in English - Monthly. Allow 4-8 weeks for initial delivery. Creative Review covers the communication arts worldwide.